In order to raise donations from PSUT students, the “Charitable Youth” campaign was also launched as donation boxes were distributed in different facilities of the University. 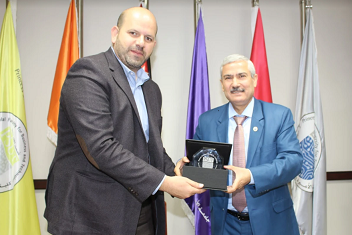 The President of PSUT, Prof. Mashhoor Al-Refai, expressed the University’s desire to set up a cooperation between the two parties and build a culture of volunteering among the University’s students in order to encourage social responsibility, widen the role of young adults and prepare them to actively participate in building and developing their society. Part of the University’s strategy of getting involved in local community development, is to lend support to the Fund, thereby contributing to the education of needy orphans and reducing the poverty rate in Jordan. Prof. Al-Refai also presented the University’s history, its academic programs and international activities, including the joint programs run in collaboration with a number of international universities. Prof. Al-Refai also highlighted the University’s excellent record in providing the Kingdom’s computer and ICT sector with graduates who are fully qualified, academically and technically, and prepared to work anywhere in the world. 89% of PSUT graduates succeed in gaining employment in various sectors within 6 months of graduation. In addition, the University has introduced a number of new programs, the most prominent of which are the Master of Science in Data Science, Master of Engineering Administration, and Doctor of Computer Science. The University offers student scholarships under cooperation agreements with a number of companies and donors to help outstanding students complete their educational careers. The General Manager of Al Aman Fund, Mr. Ibrahim Al-Ahmad, praised PSUT’s reputation, which encouraged the Fund’s desire to strengthen relations and set up means of cooperation between the two parties, leading to the provision of care and an education to young orphaned students which will help them on the way to becoming self-reliant, productive and successful members of their community. Launched in 2003 under an initiative of HM Queen Rania Al Abdullah, Al Aman Fund for the Future of Orphans was fully established in 2006 and aims to provide young orphans, both male and female, with opportunities to complete their higher education in universities and community colleges, or to pursue vocational education. The Fund believes that investment in the education of orphans is a benefit for the entire community because of its positive impact beyond graduation.